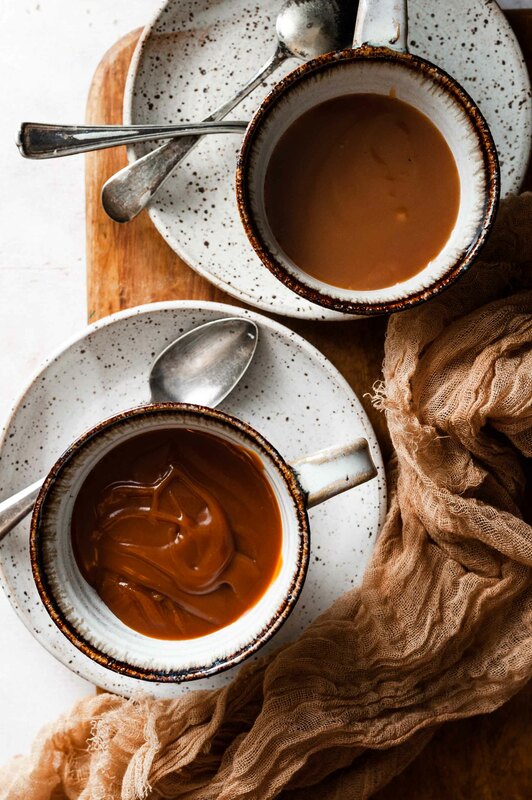 Salted Caramel Sauce can be made in two different colors with different flavor profiles. My personal preference is dark caramel sauce which has a stronger flavor than its more popular counterpart the light caramel sauce. 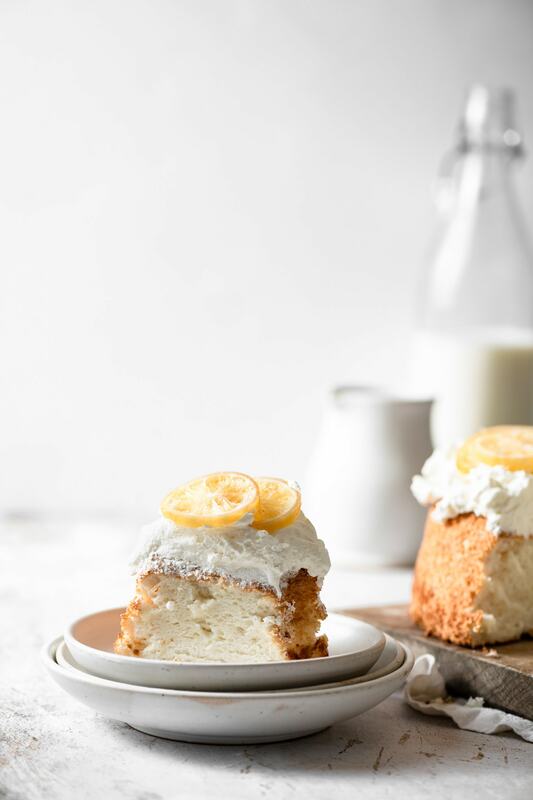 Both versions are equally delicious and perfect for drizzling on desserts, adding to bakes goods, or just plain eating with a spoon! The longer your sugar cooks the darker in color it will become. Starting with a pale yellow then an amber, and finally turning into a rich amber color. The light/medium amber is most commonly used and creates a slightly sweet flavor perfect for chewy caramel and cookies. Wait just a few seconds until it’s a bit richer in amber color and you can create a bolder bittersweet flavor most commonly used for ice cream. Sugar darkens very quickly and the almost burnt color will result in a very bitter flavor requiring lots of cream to balance it out. I suggest trying both light and dark caramel to see which one you like best. 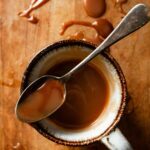 Before you start thinking to yourself that caramel sauce is too hard to make at home, just continue reading and I’ll prove its really quite easy. All you need is a little patience and timing. If you mess up in the sugar phase, don’t stress. All you’ve lost is one cup of sugar, so simply try again. Making caramel sauce is really a game of knowing what color you’re going for and removing the sugar from heat before it gets too dark. 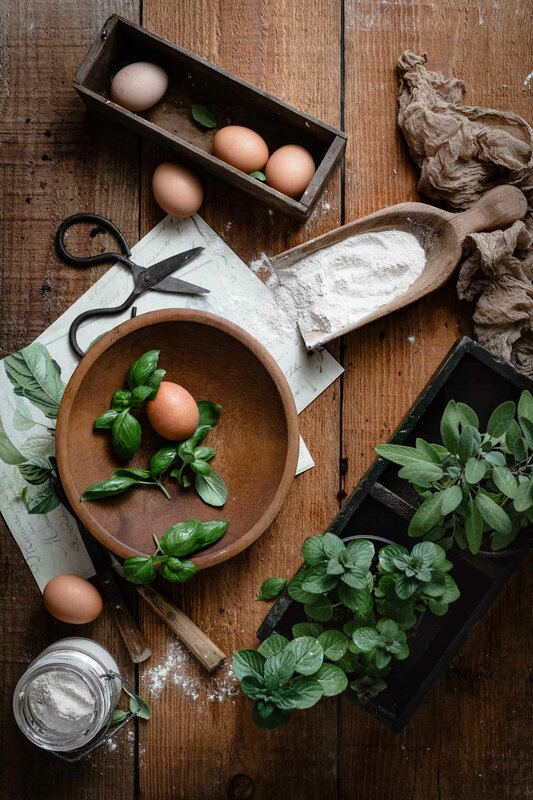 Measure all your ingredients and have them laid out next to the stove top for easy access. I chose to add water to the sugar when heating and find it really helps keep it from burning, sticking to the pot, and makes the whole process easier. Combine your sugar and water in the pan, whisk together. Turn the heat to medium until the sugar dissolves and it starts to bubble. Increase the heat to medium-high and let the sugar mixture come to a medium boil. You don’t have to stir, just swirl every now and then from the pan handle and let it simmer. Watch as your sugar starts to change in color. It may take anywhere form 5-8 minutes to see a color change. But,once it starts, it will transform quickly. Changing from pale yellow, yellow, light orange amber, medium amber, strong amber, and dark amber brown. For Light Caramel Sauce, remove your pan from the heat at light orange amber to medium amber. Even though you have taken the pot away from the heat, it will continue to cook. To prevent darkening any further start to add your butter and cream. ADD BUTTER AND CREAM SLOWLY!! I drop in 1 TBSP of butter with 2 TBSP cream at a time. The hot sugar will bubble up quickly and spit as it devours the butter and cream. Keep your face back and slowly stir ingredients with a wooden spoon. As the cold ingredients are incorporated, the hot sugar will stop cooking and transform into caramel sauce. Sprinkle in your salt and stir for a salted caramel flavor. You will notice the sugar may darken as you add the butter and cream. If you feel it has gotten too dark, try a second batch removing the sugar from the heat at a lighter color. Again, making caramel is about timing and deciding on what color sugar you want to work with. 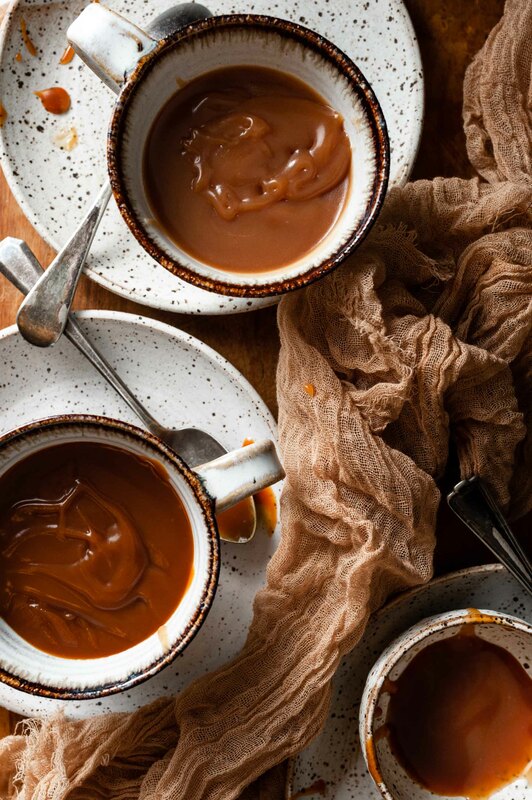 To make Dark Caramel Sauce repeat the entire process, removing your sugar from the heat when its a richer amber color. If your dark caramel sauce is too bitter, simply add more cream and taste. Be careful not to burn your sugar, this dark black consistency is very bitter and disgusting! Now, once you’ve made your caramel sauces, let them cool in the saucepan for about 5 minutes before transferring to a mason jar. I prefer mason jars because the glass is quite thick and strong and easy to seal with a twist lid. If you pour hot caramel into a glass jar it could crack the glass. Pour caramel sauce into mason jar and store in the fridge. Caramel will thicken as it cools. Stirring hot sugar while it boils can cause crystallization. Hard bubbles on the side of pan. Instead, swirl your pan to move the sugar around. If your caramel begins to crystallize, simply take a wet pastry brush and sweep the sugar on the walls of the pan downward. Or you can put a lid on your saucepan. The condensation created will wash down the crystals. How long will Homemade Salted Caramel Sauce stay fresh in the fridge? 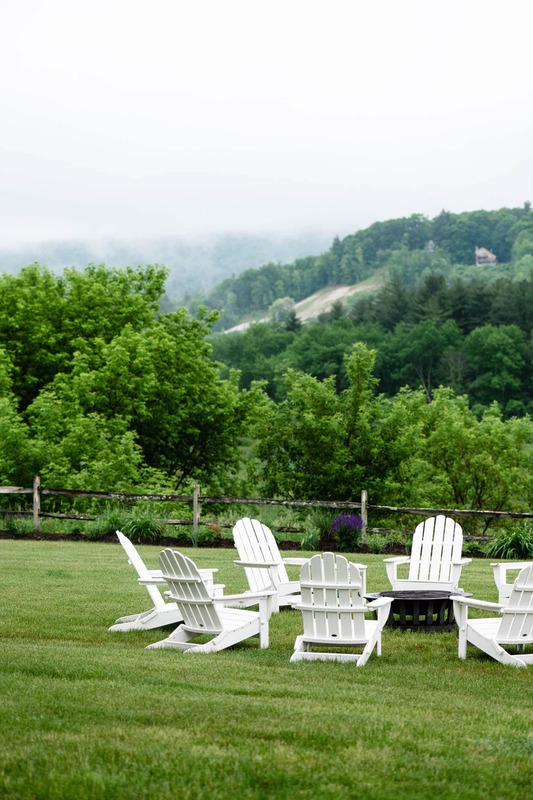 Stored in an airtight container, homemade caramel will remain fresh for up to 1 month. 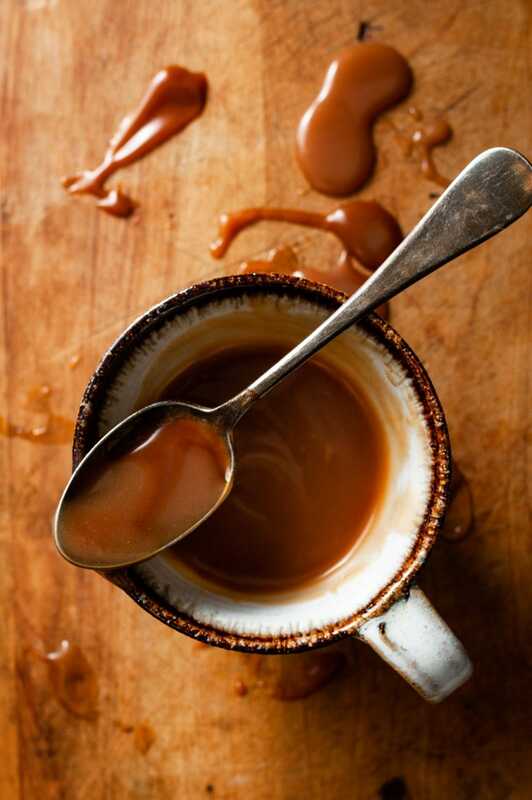 Caramel is thicker when cooled, so heat slightly to create a thinner consistency before serving. 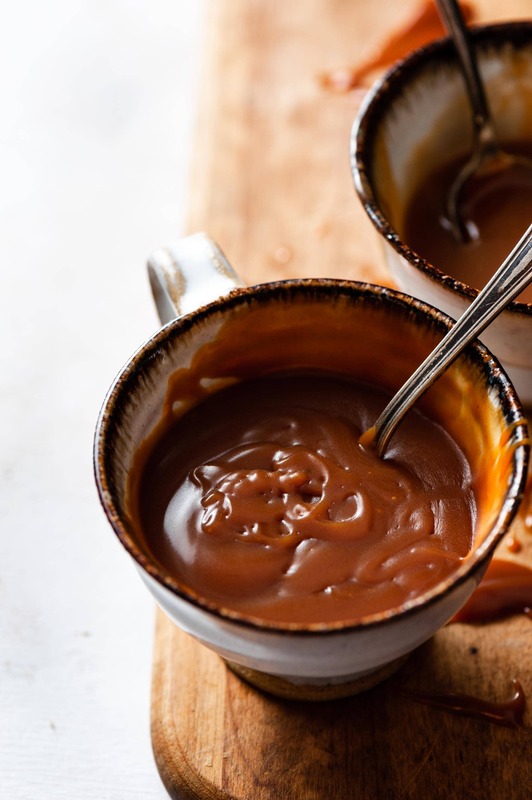 Homemade Salted Caramel Sauce made with sugar, butter, and cream. Easy recipe for both light caramel and dark caramel flavors. Add the sugar and water into a medium saucepan, whisk gently to mix. Watch until sugar changes to the desired shade of amber (lighter for light caramel and medium-dark for dark caramel). Continue until all butter and cream are added and caramel is smooth. Pour in vanilla extract and sprinkle in the salt. Stir again and let cool to room temperature. Transfer caramel to a mason jar and refrigerate. Caramel with thicken as it cools.